There is nothing like the colour or flavour of home grown beetroot. One of my friends grows several varieties, all various shades of pink and magenta. 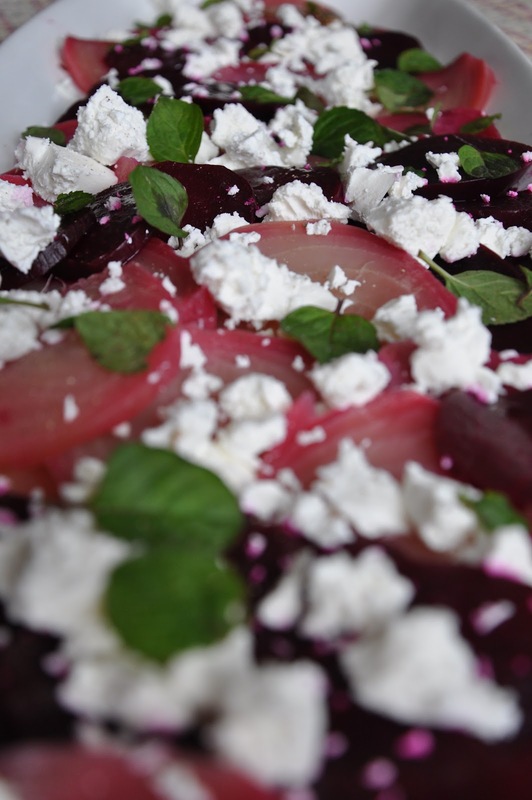 I discovered Llewellyn’s apple balsamic vinegar this year, the sweet acidity of the Vinegar is a perfect foil to the earthy beetroot, which is complemented further by some crumbled Knocklara Sheeps cheese. Simply, cover the beetroot in cold water and bring to the boil, simmer until tender, the cooking time will vary according to the size of the beetroot. Allow to cool when cool enough to handle, peel off the outside skin and root. Slice thinly and arrange on a serving dish. Drizzle with olive oil and vinegar, and season with a little Maldon sea salt and freshly ground pepper. Crumble the cheese over the beetroot and scatter the mint leaves on top.